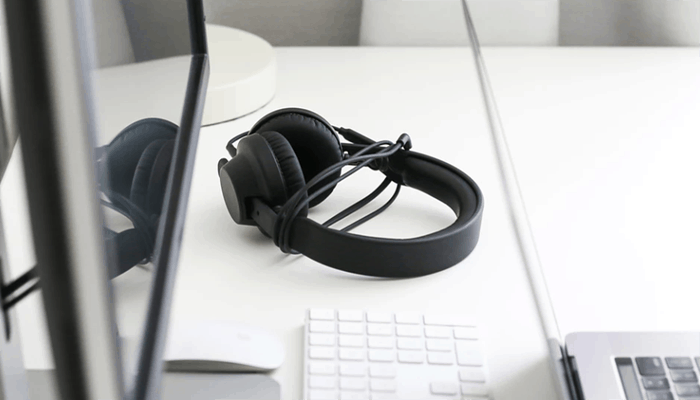 Many of us have owned more sets of headphones that we probably dare to divulge, they are often subject to a fair amount of rough and tumble as well as the occasional unexpected accident. 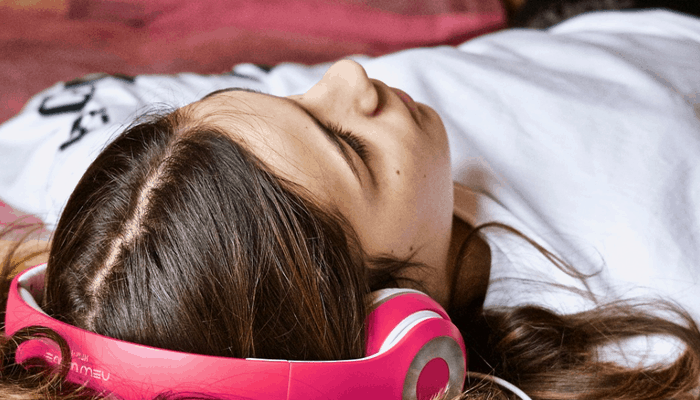 In this article, we have rounded up the 10 best waterproof headphones in 2019 for a look at exactly what is on offer on the current market. Waterproofing methods have improved steadily as technological development has evolved to the point where we have some exceptionally clever methods employed to ensure we have access to all our mod-cons, come rain or come shine. What is a waterproof headphone? Do waterproof headphones really work? How reliable are waterproof headphones? What is the difference between water-resistant and waterproof headphones? The market is pretty saturated with many competitive pairs of water-faring earphones fighting for the top spot. 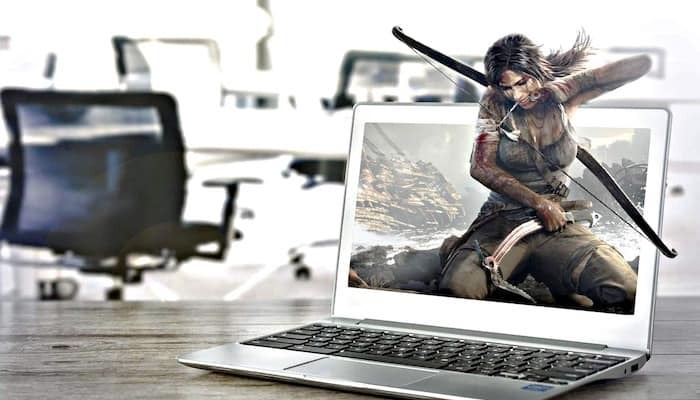 We have compiled some of the most popular products and provided a useful buyers guide to help give you all the info you could possibly need. Great boosted bass that maintains a good balance. First we have selected a wonderful wireless over-ear earbud option, aimed at the athletically inclined. They are very flexible but maintain great durability. They are an ideal solution for those on the go and provide clear audio even at low volumes. They are IPX7 certified which should keep them safe if they are soaked. All internal components are capably covered by a nano-coating that keeps them sufficiently sealed within. 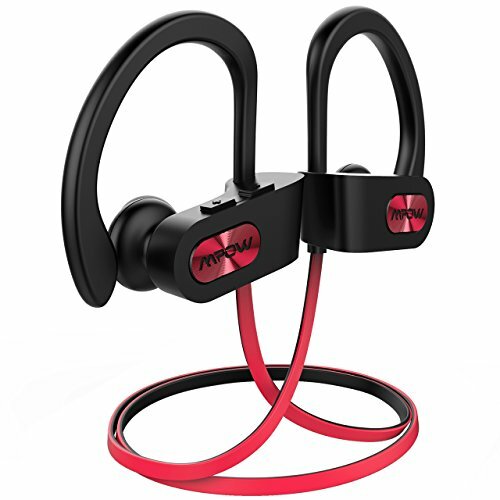 They are ergonomically designed and very comfortable to wear the nominal excess wire between each bud clips at the back of the head or neck and they wirelessly connect and stream to your Bluetooth device, effortlessly pairing and remembering the connection. They feature built-in on-board multi-function button control so you don't have to keep retrieving your mobile as you run and have extensive battery life. They have an internal mic for hands-free calls and voice commanding. 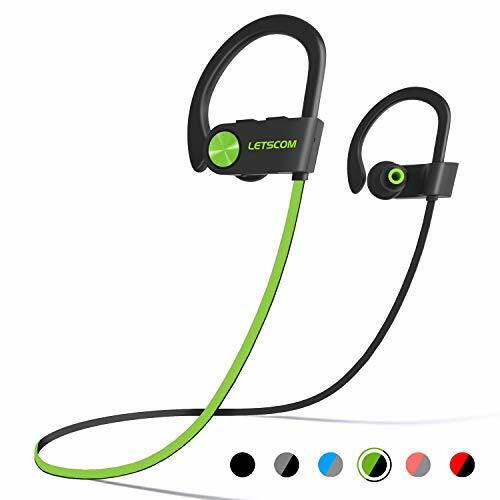 Why We Liked It - They are ergonomically designed and feature the highest level of waterproofing certification, their wireless nature makes them ideal for jogging in wet weather as well as intense workouts. Our second item is also completely submersible, they are just a simple earbud option to sit comfortably in the ear. They feature some advanced synthetic components which serve up perfect protection so that they can actually be worn whilst swimming which is pretty impressive. They are a wired earphone ideal for use with a Surge+ submersible players. They too feature the highest certification rendering them reliable for resisting everything from heavy perspiration, through rainstorms and rowing races all the way to swimming a 3.5 meters below the surface. Their boosted but balanced bass capabilities are enhanced by their flush to the ear, canal-channeling ergonomic design. They come with 4 pairs of replacement buds making 5 pairs in total. + Great boosted bass that maintains a good balance. Why We Liked It - The sound is great quality and they feature premium bass optimization and are less likely to distort. The Otium model differs very little from the Letscom model, it too hangs suspended over ear with the bud cradled inside of the ear canal. This over-ear design gives much more freedom of movement making them ideal for runners as they are less likely to slip out during motion. 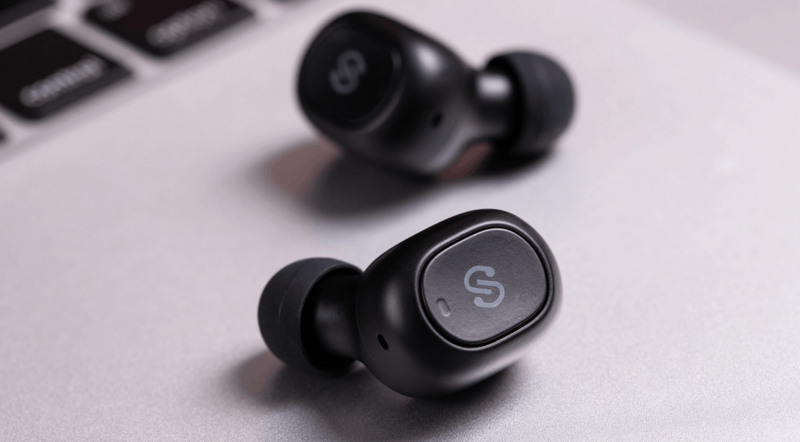 They are once again wireless and can connect to your iOS devices, which further enables a better range of motion as you aren't encumbered by wires. 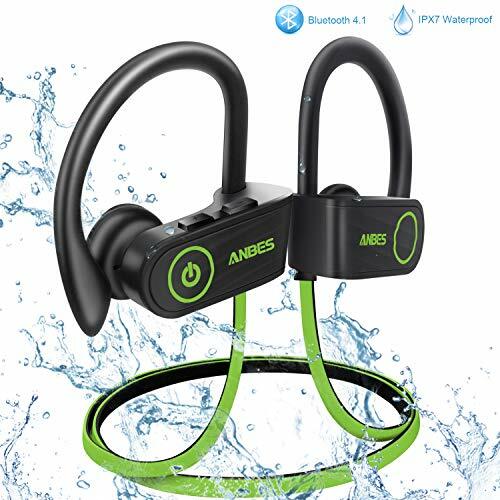 They have built-in easy to use controls, can be used as a hands-free device, thanks to their mic, and offer the same high-level IPX7 certified waterproof nano coating. They are priced at the same competitive level but offer a slightly longer battery life at full volume. 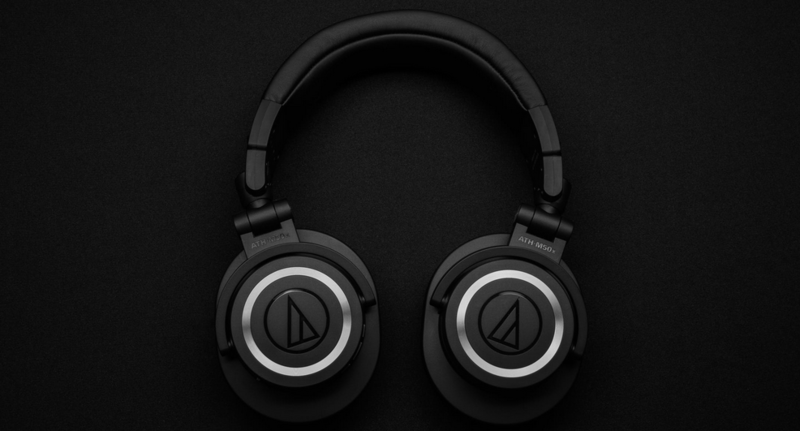 The biggest advantage over their competitor is they harbor some advanced dynamic drivers with composite diaphragms that provide better low-frequency audio. Why We Liked It - They are a great set, the design means the buds stay in place and the audio is good quality. 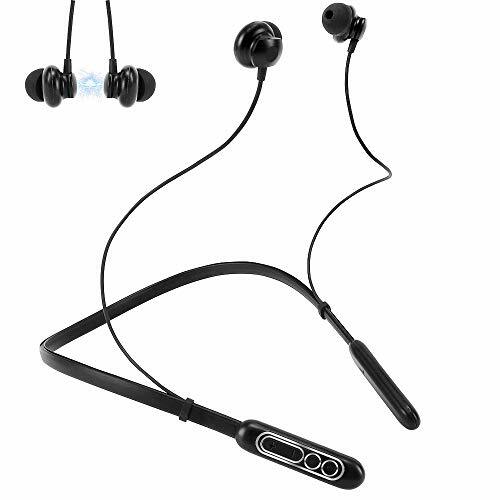 Another very similar alternative are these waterproof headphones from Mpow. They feature a new and improved adjustable over-ear hook. This gives the device a snugger fit and better speaker positioning and is now made from a hardened more stable and non-slip composite. Other added comfort they have been updated to provide is a high-quality set of memory foam tips. They are a great sounding set of earphones which provide HD sound and a richer bass thanks to their refined array design which draws on extensive research and development. They too have IPX7 certification offering the best protection to ensure they can endure even the most grueling of workouts and be safeguarded from profuse sweating. Why We Liked It - They have had some great performance enhancing refinements to the driver circuitry updated and are fully adjustable. Another submersible set up for grabs which won't disappoint are these Swimbuds designed for underwater swimming and flip-turns. 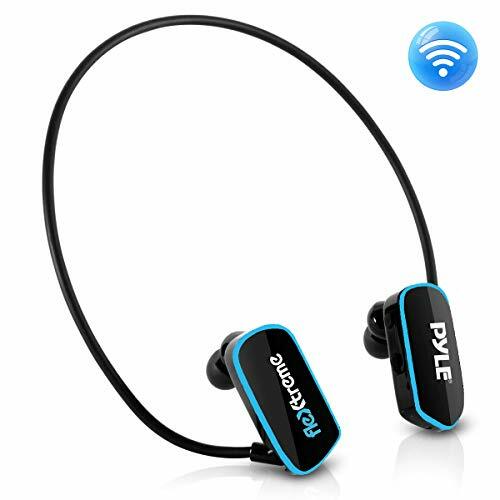 They are manufactured with typical ear-bud design and are designed with waterproof iPod use in mind, and are even sold online as part of a promotion with them. 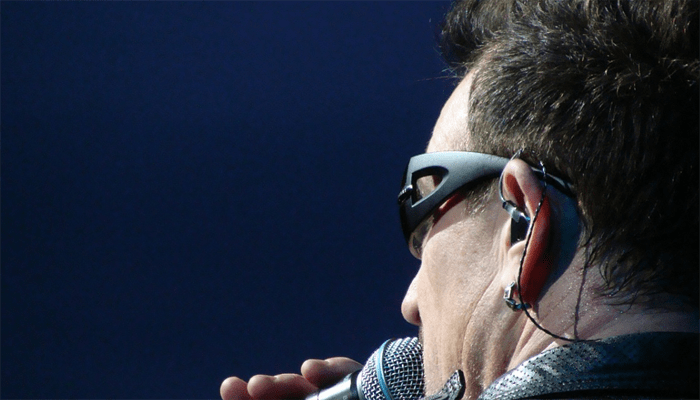 The earbuds themselves are ever so slightly flanged to create a good seal within the ear canal. They produce a wired solution which keeps the wires out of the way. They are shortened and made to plug into a swim-goggle mounted iPod but extend (like a lanyard) to a standard length for multiple uses. This also helps to keep them tangle free when packed away. All components used in the fabrication are water resistant, as they have nano coverings. Featuring a gold plated stereo jack which is not only more waterproof but provides a distortion-free signal. 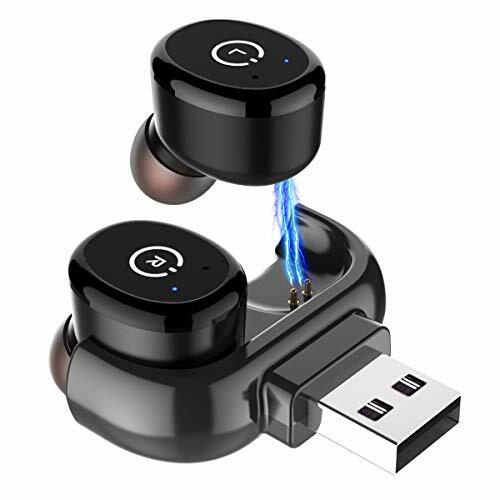 They come with FitGoo waterproof earbud lubricant and 4 different style earbud tips, so you can find which fits you best. + For use with goggle mounted amphibious iPod. Why We Liked It - The flanged wing helps form a seal and direct the audio directly, as well as keep them in your ears whilst you swim. Now for an earbud design with a comfortable collar that drapes around the back of your neck. The wired earbuds are connected directly to the handy brace so you can put them in and out, and rest assured they will safely dangle where you can access them easily. They are Bluetooth capable and can simultaneously connect with 2 devices for remembered pairing. They feature an IPX7 certified outer casing and the circuitry is nano-coated. One of their best features is that included in their onboard controls are 4 predetermined equalization settings which provide different bass mid and treble levels serving up 4 very different qualities of audio each best suited to different types of audio/ or speech as in the case of hands-free voice calls. + Built in EQ presets. Why We Liked It - We like the thought that has gone into the design and the being able to switch between the saved equalization settings is a bonus. Platronics really kicked it up a notch with this wireless waterproof workout set. They feature a flexible BackBeat fit design which uses ear loops is very secure and curved to be ergonomically comfy. The innovative 'always alert' earbud tip design ensures that you can listen to audio but also be aware of your surroundings. This along with their reflective surface decals mean that they are ideal for running after work on those winter evenings when daylight is shorter. They are IPX5/7 certified making them very waterproof as well as pretty dust and airtight rendering them one of the most robust solutions we have looked at so far. They feature all the benefits of Bluetooth connectivity and hands-free calls and voice activation, but to trump, the rest the folks at Plantronics have developed an App. The iOs app allows for tap activated controls and makes your workout audio all the more manageable. The wireless signal transmits across a large distance so you can keep mobile devices tucked away and control them remotely via the app. They also have a built-in stop-watch timer function which we thought was a nice touch. + Reflective surfaces and always alert tips. + App based My Tap feature. Why We Liked It - They are definitely a high quality model for gym goers who like to pump to their own jams. We love the added safety features which render them ideal for night-time runs. Another superbly sealed swimwear pair are these flexible little wrap-around beauts from Pyle. 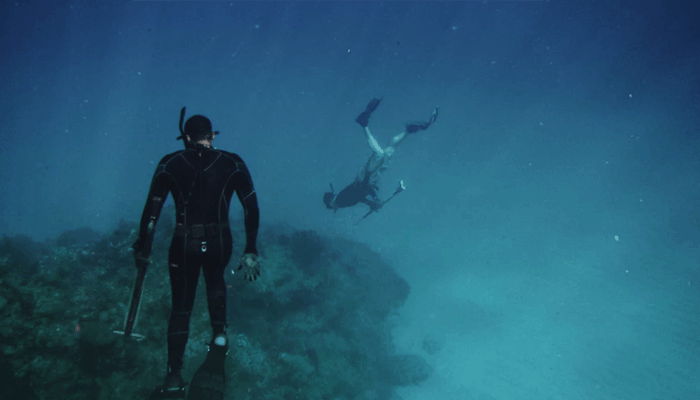 They are fully submersible up to 3 meters deep and made from high-grade water resistant material. One of their most notable features is that they are equipped with a 4gb flash memory space so you can store your songs directly on the device itself for situations where you wouldn't necessarily want to leave your mobile within transmission field distances for example poolside. The earbud tips feature a water blocking lip design which stops water getting into the ear forming a seal. They have whopping 10-hour battery life, charge fully in under 2 hours and are affordably priced. Why We Liked It - They offer premium protection in a comfortable package, benefit from on-board storage for your tunes and wont break the bank. Another over-ear option worth a look in is this set from ANBES we were asked to compare with the other similarly priced models. In truth, it doesn't really offer up anything different in terms of its capabilities, in fact, we suspect some of their parts are manufactured on the same factory lines. The Bluetooth, transmission, IPX certification, and design are essentially the same. 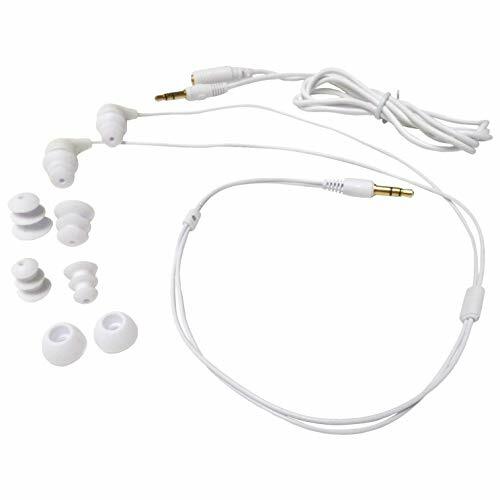 They do come in a wider range of colors which could be desirable if you like to accessorize as well as exercise but otherwise speaking they match the specs of the other over ear-models down to a T.
They are thoroughly waterproof, utilizing a nano-covering to seal all components and the earbuds feature a rim to help keep them in position and allow for unrestricted motion. They have some built-in controls and are comfy to wear. They are a universal size and come with a clip for the excess wire which dangles behind the head. + Comfy one-size fits all design. Why We Liked It - They are another option which wont set you back too heavily. Some might say we have saved the best for last, we will say we have saved something different for last. This entry is the most compact of the lot they are a pair of completely wireless in ear-buds which can be worn discreetly spy-style. They come with a miniature USB charging dock that they magnetically adhere to, a measure which may help ensure you don't lose the little guys. 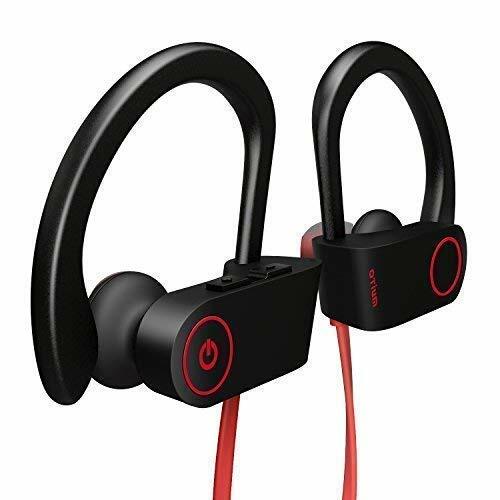 They serve up decent hi-fi comparable audio and are IPX 6/8 certified offering the latest cutting edge development to keep all of the electronic components protected. They can survive 30 minutes at a 2-meter submersion and are pretty darn impressive. They are affordably priced and have a battery life of around 4 hours and a charging time requirement of 1.5 hours which is fairly reasonable for a USB option. They work within a 10-meter radius of the paired device. Why We Liked It - They are a miniature modern marvel that you can swim with for short periods, we think their price is pretty appealing as well. 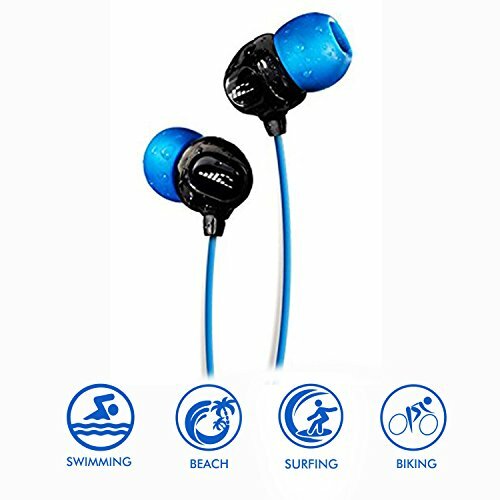 A waterproof set of headphones function in exactly the same manner as a regular set but they have been manufactured from parts which have all received a seal of approval to counter water damage. Know we all know that water and electricity do not mix, so some of the lengths companies have to go to to protect against full immersion are pretty advanced. The materials used are nearly always synthetic by nature, and typically they are rubber, plastic, and silicone based. Quite often the circuitry can remain the same if they are completely self-contained. 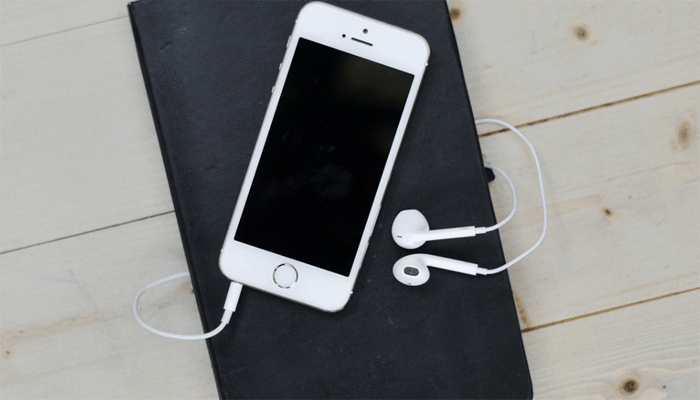 To encase the electronic components inside something the size of an ear-bud is no easy feat and generally nano-technology research is relied upon to assist in miniature manufacturing. Some metallic components will be switched to metals which will not rust, or if not they are covered with an anti-rusting coating. Waterproof headphones/earphones/earbuds are sometimes referred to as amphibious or hydro-active. There are many reasons someone might require a waterproof set of headphones. 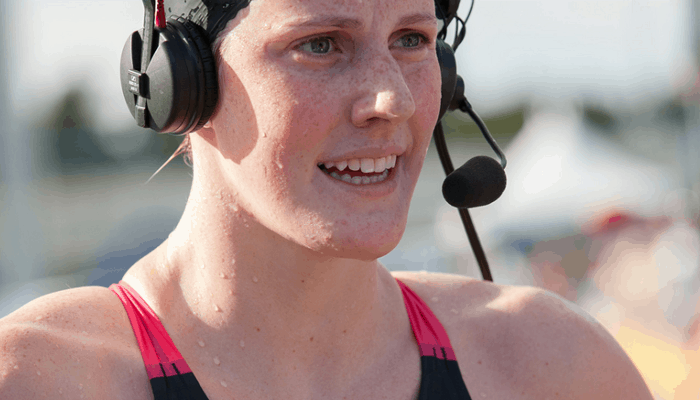 Many are listed for athletes because as anyone who likes to work out knows the perils of having a set of ear-phones exposed to the heavy sweating of a more rigorous regime. 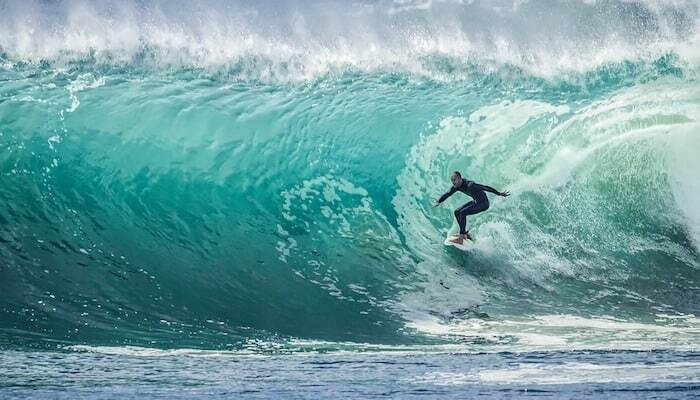 With waterproofing being much more reliable than ever before we are now seeing models marketed towards rowing, windsurfing, white water rafting, and other water sports. Some can withstand submersion making them suitable for swimming. 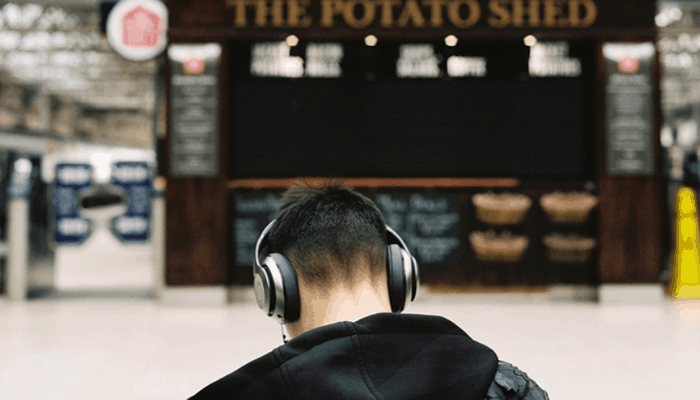 Another angle, that some may have not considered is that there are many people with sensory needs who rely on being able to wear noise-canceling earbuds to protect them from an auditory overloaded. All of the models we have looked at have noise canceling abilities, with the exception of the pair designed specifically to stay aware of your surroundings for added safety by Plantronics. This can be a great solution for some people on the Autism spectrum, who can also have an attraction to water, finding swimming and floating soothing. Having waterproof noise canceling headphones provides a way for them to enjoy the water without the noise stimulus that many of them can struggle with. If they are suitably protected then yes some come with a certification which helps to gauge the level of resilience. To truly be waterproof all electronics need to be housed in an airtight/watertight sealed unit. Any metallic components need to be of metals which do not rust or to be treated to prevent/eliminate rust (rust-proofing). Once again, the better quality products on the market we have explained sufficiently protected so in general, they are pretty reliable, however as with anything else electronic they have a 'shelf-life'. Everyday wear and tear will inevitably take its toll and long term this can have a detrimental effect. If any barriers or sealed areas become compromised then obviously you are going to be in murky waters. They are essentially both words for a product which has been designed, changed, upgraded or treated to remain unaffected by water, though generally, people associate water resistant with being less effective at persevering than water-proof. This is pretty misconceived as there are varying degrees to which an object can be waterproof or water-resilient. Water resilient actually tells us that the materials used within the construction of the product, especially its outer elements (shells/casing etc) are able to repel water droplets to a certain extent. If you spill liquid on a very water resistant object you would see the water droplets roll off of it and pool away. We IP (or IPX) rate the enclosure of each item, designating it a number that relates to how ‘dust-tight’ or 'air-tight' and also waterproof the housing of the product is. If it is suitably dust/airtight then the product is deemed proofed against water and other particles getting inside to damage internal parts. The numbers generally go from 1-7 but recently an additional level IPX8 was added as the waterproofing available to the public is now on par with professional scuba transmission equipment. 1 indicates not at all, 2 means condensation proof it continues all the way through to fully submersible via a series of incremental categories which include water droplet proof, protected against water sprays, spills, and low-pressure jets and temporary immersion (which protects against accidents). IPX8 states that it features the most up to date immersion protection and can deal with greater depths and pressures. Within product specifications that feature 2 figures, the first is in reference to how air/dust tight it is and the second digit determines how watertight. 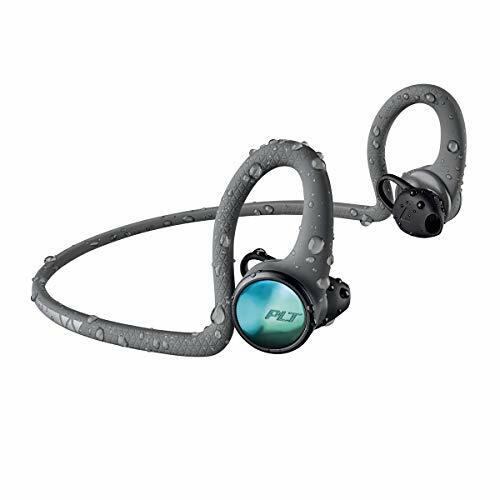 For example, the Plantronics BackBeat FIT set are certified as IPX 5/7 this means they are not completely airtight but are very waterproof, this is because of the unique 'Always Alert' design concept they employ which leaves parts of it exposed, the rain, however, will not affect any internal components. Whether you want to synchronize your swimming to the psychedelic sounds of the sixties, or simply lounge pool-side on Spotify soaking up the sun waterproof headphones are a sensible solution. Many of the lower-end sets won't set you back more than twenty bucks and they offer reassurance against the rain and quite often, are completely wireless. This eliminates one of the most common culprits to break on you, extending the life of a typical pair tenfold. Heck, even the wired sets have nifty features like retractable/extendable wires to help counter the all too familiar 'knotting in your pocket' routine. We would highly recommend any of the over-ear sets for any joggers out their they allow for great freedom of movement and they won't sweat to death on you, but if you are looking to swim with them we suggest you set your sights a little higher. With any luck, our reviews and waterproof headphones buyers guide will have shed a little light on just what you can get your hands on as well as how and why it works. We hope they serve useful on the path to your purchase. If you are going to swim with your set of headphones make sure you adhere to the recommended lengths of time submerged, heed the maximum stated depths and make sure you allow them to properly dry before packing them away, they will succumb to ruin if improperly used. Whilst the majority of public products only allow for a depth of between 2-4 meters, the worlds first 20 meter diving headphones the MH180V-AA's were the first amphibious tactical-headphones developed for military use they incorporate a boom and a microphone and work utilizing bone conduction!